Dear Nicholas, I just came upon a description of the soul’s afterlife that perfectly describes the intimations I’ve had about what happens to our spirits after death. I was astonished to come across this; I wasn’t looking for any such thing in the book I was reading. 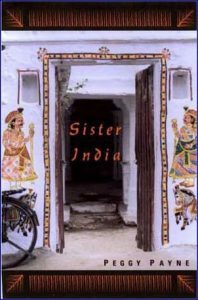 The book is A Search in Secret India by Paul Brunton. Bob gave it to me for Christmas. What’s also surprising is that I hadn’t read it before in my research for writing either Sister India or Cobalt Blue. I had read a good quote from Brunton on the esoteric subject of kundalini which is central in my novel Cobalt Blue. But that’s the only contact I’d had with his work. As a journalist and skeptic who set out on a lifelong spiritual exploration through many cultures, Brunton played a large part in introducing Eastern philosophy and mysticism to the West. Some of his books have remained in print steadily for the past 75 years. 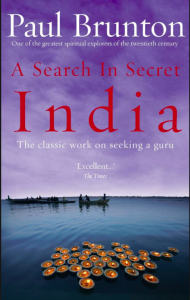 A Search in Secret India is a report on his experience hunting throughout India in 1931 for a genuine holy man, a guru. Just when he was at the point of giving up and returning home, he found his man. Here’s what I found on pages 304-305 describing an experience in meditation “in a jungle hermitage” with Ramana Maharishi. Finally it happens…..The brain has passed into a state of complete suspension, as it does in deep sleep, yet there is not the slightest loss of consciousness. I remain perfectly calm and fully aware of who I am and what is occurring. Yet my sense of awareness has been drawn out of the narrow confines of the separate personality ; it has turned into something sublimely all-embracing. Self still exists, but it is a changed, radiant self. For something that is far superior to the unimportant personality which was I, some deeper, diviner being rises into consciousness and becomes me…. The planet which has so far harbored me, disappears. I am in the midst of a ocean of blazing light. The latter, I feel rather than think, is the primeval stuff out of which worlds are created, the first state of matter. . . It stretches away into untellable infinite space, incredibly alive. I’ve not been able to accept the idea that one’s self disappears into nothingness or (dreadful thought) melts into some giant puddle of spiritual matter, or remains the same. 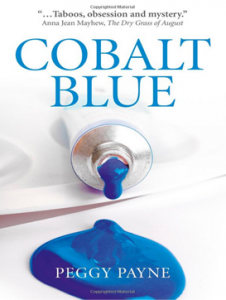 In fact, my novel Cobalt Blue is about a woman trying to “break out of the narrow confines of the separate personality,” but she compulsively goes about it the wrong way. Brunton articulates what I’ve long thought and felt, but never said to myself so clearly. This could easily be considered confirmation bias or wishful thinking. That doesn’t seem to matter to me. I find his experience, bringing into focus my own impressions, to be profoundly heartening, sustaining, satisfying. Life’s so far biggest puzzle. What happens after death? A true Indian concept is essentially recycling. There are way too many souls, now and historically, to not reuse. As strange and ridiculous as that sounds, say out loud every other belief or theory you have heard. Makes as much sense to me as anything, Ron! Perfect, Bob! Thanks for this. I do wonder, though, about that use of “all.” Does suggest that some sleep.